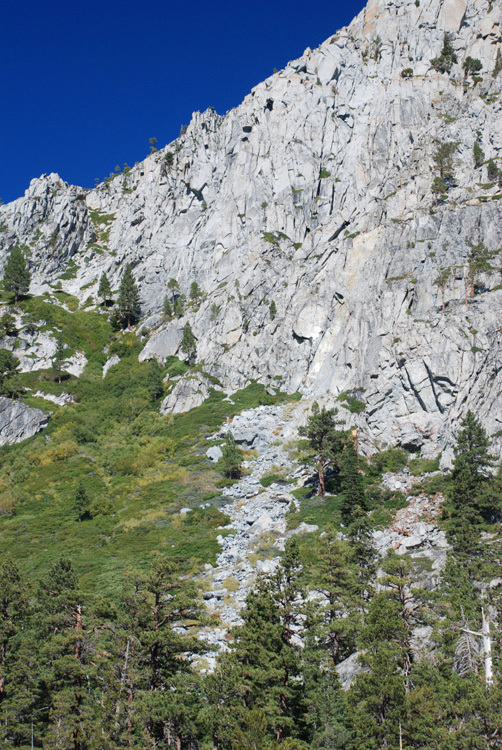 A talus slope, partially covered in vegetation. There is a little gully that leads to the no-veg part of the slope. The gully appears to be an intrusive dike with a slightly weaker rock that has been eroded out. Currently water and snow probably collect in the gully and wipe the vegetation out as they make their way down onto the talus slope. The water could just remove the fine material (sand/silt/clay) that the vegetation needs to survive. The snow avalanches might just physically tear up the vegetation.